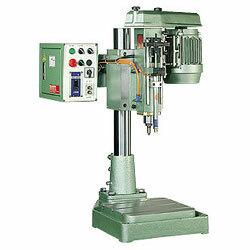 2.Vertical column structure is enlarged, the more stable the more perfect when drilling process. 3.The vertical lift seat is to adopt the model No. JT-6516. 1. Main spindle max. stroke(mm): standard-85, extension-100,150. 2. Drilling hole capacity(mm): 1~10. 3. Working table size(mm): 340 x 340. 4. Motor: 2HPX2PX4P. 5. Drilling power(kg/cm)2: pneumatic 5. 6. Packing dimension(L)x(W)x(H): 115 x 82 x 112(cm). 7. Net Weight(kg): about 190. 8. G.Weight(kg): 270.